Patients with peripheral arterial disease (PAD) are at increased risk for ESRD and cardiovascular events. The primary objective was to assess the association between ankle-brachial index (ABI) values and renal outcome. The secondary objective was to evaluate whether statins and angiotensin-converting enzyme inhibitors (ACEI) are associated with improved renal and cardiovascular outcome in patients with PAD. In a prospective observational cohort study of 1940 consecutive patients with PAD, ABI was measured and chronic statin and ACEI therapy was noted at baseline. Serial creatinine concentrations were obtained at baseline, 6 mo, and every year after enrollment. End points were ESRD, all-cause mortality, and cardiac events during a median follow-up period of 8 yr. Baseline estimated GFR <60 ml/min per 1.73 m2 was assessed in 27% of patients. ESRD, all-cause mortality, and cardiac events occurred in 10, 46, and 31% of patients, respectively. In multivariate analysis, a lower baseline ABI was significantly associated with a higher progression rate of ESRD (hazard ratio [HR] per 0.10 decrease 1.34; 95% confidence interval [CI] 1.21 to 1.49). Chronic use of statins and ACEI were significantly associated with lower ESRD (HR 0.41 [95% CI 0.28 to 0.63] and 0.74 [95% CI 0.54 to 0.98], respectively), mortality (HR 0.66; [95% CI 0.55 to 0.82] and 0.84 [95% CI 78 to 0.95], respectively), and cardiac events (HR 0.71 [95% CI 0.56 to 0.91] and 0.81 [95% CI 0.68 to 0.96], respectively). In patients with PAD, low ABI values independently predict the onset of ESRD. Less progression toward ESRD and improved cardiovascular outcome was observed among patients who were on long-term statins and ACEI. Lower extremity peripheral arterial disease (PAD) is a manifestation of systemic atherosclerosis and has been recognized as a growing health burden worldwide (1). In the United states, prevalence rates for PAD have been reported ranging from 4% in patients who are ≥40 yr to 29% in patients who are older than 70 yr or aged 50 to 59 yr and have a history of smoking or diabetes (2–6). The prevalence and the incidence of PAD are high among patients with renal insufficiency (7–9). Little information is available about the prognostic value of renal insufficiency in patients with PAD, although this may be useful to identify high-risk patients who may benefit from subsequent medical therapy (10). As a result of atherosclerotic lesions in the renal artery or renal microvascular system, patients with PAD may be at increased risk for developing ESRD. The association between the extent of atherosclerosis, as defined by ankle-brachial index (ABI) values, and the onset of ESRD remains ill-defined. Several studies have suggested that statins and angiotensin-converting enzyme inhibitors (ACEI) can slow or halt the progression of chronic kidney disease (11). Given that statins and ACEI can inhibit the atherosclerotic process and reduce cardiovascular events (12–15), a beneficial effect of statins and ACEI on renal outcome may be anticipated in patients who present with lower extremity PAD. In this observational cohort study, our primary aim was to determine the association between baseline ABI values and renal outcome in patients with PAD. Our secondary objective was to evaluate whether long-term use of statins and ACEI was associated with a lower progression rate of ESRD, mortality, and cardiovascular events during long-term follow-up. This was a single-center observational cohort study of consecutive patients who had PAD and were referred to the Erasmus Medical Center between January 1988 and January 2006. The Erasmus Medical Center serves a population of approximately 3 million people and acts as a tertiary referral enter for approximately 30 affiliated hospitals. Patients were referred for ABI measurement, clinical evaluation, and therapeutic treatment. These patients presented with symptoms of PAD, which included typical intermittent claudication or other symptoms of chronic arterial insufficiency, such as ulceration of the foot, hair loss, or reduced capillary refill. Patients who were eligible for the study had to be older than 18 yr, and only patients with an ABI of 0.90 or less were included. Patients with one or more episodes of dialysis during the 6 mo before enrollment were excluded. All patients agreed on participation in the study, and the study was conducted according to the Declaration of Helsinki. During the first visit, patients were screened for clinical risk factors, ABI values, and 12-lead electrocardiographic abnormalities. The long-term use of statins and ACEI was ascertained when patients were taking these medications for at least 1 yr after the first visit. According to the hospital’s protocol, ACEI were not prescribed in patients who presented with significant bilateral renal artery stenosis (>70 or >50% with poststenotic dilation) or stenosis to a solitary kidney or to patients with decompensated congestive heart failure in a sodium-depleted state. Diabetes was recorded when patients presented with a fasting glucose level of ≥126 mg/dl (7.0 mmol/L) or in those who required treatment. Hypertension was recorded when patients presented with a BP ≥140/90 mmHg or were medically treated for hypertension. Smoking included only current smoking. A baseline electrocardiogram was obtained in all patients and was considered abnormal in the presence of one or more of the following: Q waves, left ventricular hypertrophy, left bundle branch block, right bundle branch block, or atrial fibrillation. Clinical data were prospectively collected and stored in a computerized database. Risk factor reduction and lifestyle modifications were encouraged in all patients who presented with clinical risk factors. During follow-up visits, BP was monitored to achieve levels <140/90 mmHg or less than 130/80 mmHg for those with diabetes or kidney disease. Systolic BP (SBP) in the right and left brachial artery, right and left dorsalis pedis artery, and right and left posterior tibial artery were measured by trained technicians, using a Doppler ultrasonic instrument with an 8-MHz vascular probe (Imexdop CT+ Vascular Doppler; Miami Medical, Miami, FL). The ABI in the right and left leg was calculated by dividing the right and the left ankle pressure by the brachial pressure. The higher of the two brachial BP was used when a discrepancy in SBP was present. Again, the higher of the dorsalis pedis and posterior tibial artery pressure was used when a discrepancy in SBP between the two arteries was measured. When no pressure in the dorsalis pedis artery was obtained because of an absent dorsalis pedis artery, the pressure in the posterior tibial artery was used. The ABI was measured after the participants had been resting in the supine position for at least 10 min. Of the ABI values that were obtained in each leg, the lower was used in all analyses. Inter- and intraobserver agreement for the ABI was 97 and 98%, respectively. In all patients, a baseline serum creatinine level was obtained during the first visit from a central laboratory. Using serum creatinine, age, gender, and race, the estimated GFR (eGFR) was calculated by the following equation: GFR (ml/min per 1.73 m2) = 186 × serum creatinine level−1.154 × age−0.203 × 0.742 (if female) × 1.210 (if of African descent) (16,17). Patients were classified according to the level of renal function as recommended by the Kidney Disease Outcomes Quality Initiative of the National Kidney Foundation: Normal renal function (eGFR ≥90 ml/min per 1.73 m2), mildly reduced renal function (eGFR 60 to 89 ml/min per 1.73 m2), moderately reduced renal function (eGFR 30 to 59 ml/min per 1.73 m2), severely reduced renal function (eGFR 15 to 29 ml/min per 1.73 m2), and kidney failure (eGFR <15 ml/min per 1.73 m2). During regularly scheduled follow-up visits, serial creatinine levels were measured at 6 mo, 1 yr, and every year after the initial visit to determine deterioration in renal function, compared with baseline renal function. Baseline serum creatinine measurements were obtained in all patients, and creatinine measurements at 1 yr were obtained in 99% of the patients. Progression to ESRD was defined as the need for kidney replacement therapy (treatment with dialysis or kidney transplantation). During follow-up, primary study end points were all-cause mortality and cardiac events, which included cardiac death or nonfatal myocardial infarction. Information on all-cause mortality and cardiac events was obtained during outpatient follow-up visits, by mailed questionnaires, by telephone interviews, by reviewing hospital records, by contacting the referring physician, or by approaching the municipal civil registry to determine survival status. In patients who died during follow-up, death certificates and autopsy reports were reviewed and general practitioners were approached to ascertain the cause of death. Cardiac death was defined as death caused by acute myocardial infarction, cardiac arrhythmias, or congestive heart failure. Sudden unexpected death in a previously stable patient was considered as cardiac death. Nonfatal myocardial infarction was diagnosed when at least two of the following were present: Elevated cardiac enzyme levels (creatinine kinase [CK] level >190 U/L and CK-myocardial band >14 U/L, or CK-myocardial band fraction >10% of total CK, or cardiac troponin T >0.1 ng/ml), development of typical electrocardiographic changes (new Q waves >1 mm or >30 ms), and typical symptoms of angina pectoris. Continuous data were compared using the t test or ANOVA techniques when appropriate. Categorical data were compared using the χ2 test. The Kaplan-Meier method with the log-rank test was used to assess differences in survival between patients with different levels of renal function. Statins and ACEI were not randomly assigned in these patients, and the impact of selection bias may profoundly distort the results of our study. Propensity analyses are reliable tools to correct for selection bias, and the rationale for using propensity scores has been described previously (18). Therefore, we calculated separate propensity scores for statins and ACEI. Variables that were independently associated with the decision to prescribe statins and ACEI (P < 0.25) were included in the multivariate propensity score, which was constructed using multiple logistic regression analysis. 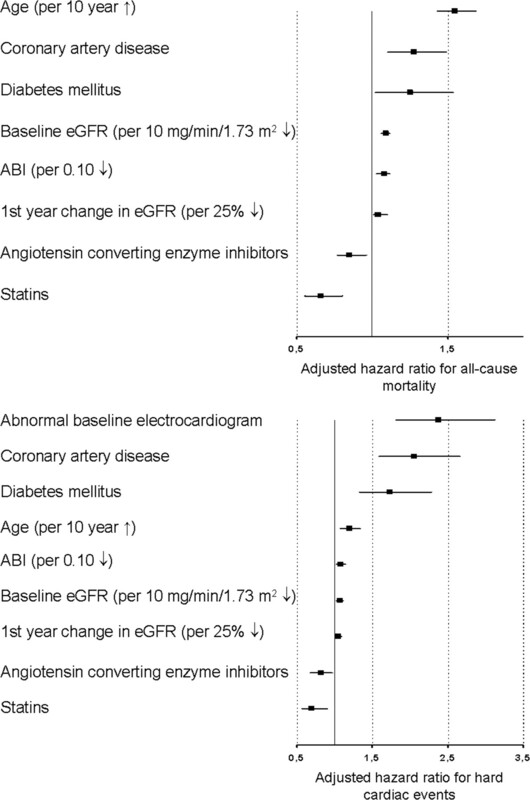 Multivariate Cox proportional hazard regression analysis was used to evaluate whether statins and ACEI were associated with lower progression toward ESRD, all-cause mortality, and cardiac events during long-term follow-up. Multivariate Cox proportional hazard regression analysis with stepwise backward deletion of the least significant variable was used to determine independent predictors of all-cause mortality and cardiac events. Propensity scores were added to all multivariate regression models. However, results were comparable in multivariate analysis with or without adjustment for weighted propensity scores. Tests for heterogeneity were used to evaluate the effect of statins and ACEI on outcome between patients with different levels of baseline renal function and between patients with or without diabetes. For all tests, P < 0.05 (two-sided) was considered significant. All analyses were performed using SPSS 11.0 statistical software (SPSS, Chicago, IL). A total of 1940 patients were available for analysis. The mean age was 64 ± 11 yr, and 1385 patients (71%) were male. The mean ABI was 0.61 ± 0.19. Severe PAD (ABI was ≤0.70) was identified in 1397 (72%) patients. An abnormal electrocardiogram was observed in 911 (47%) patients. A total of 551 (28%) patients were using long-term statins, and 515 (27%) patients were using long-term ACEI. The mean eGFR at baseline was 78 ± 31 ml/min per 1.73 m2. Normal renal function, mildly reduced renal function, moderately reduced renal function, severely reduced renal function, and kidney failure were assessed in 31, 42, 22, 3, and 2% of patients, respectively. A history of coronary artery disease, history of heart failure, diabetes, and hypertension were significantly associated with declining baseline renal function (Table 1). Mean time from baseline to last follow-up visit was 8 yr (interquartile range 4 to 11 yr). At 1-yr follow-up, a reduction in eGFR of >25% was assessed in 211 (11%) patients. Assessment of renal function at the last follow-up visit revealed a reduction in eGFR of >25% in 443 (23%) patients and progression to ESRD in 198 (10%) patients. Improvement in eGFR of >25% was assessed in 293 (15%) patients. All-cause mortality occurred in 889 (46%) patients, cardiac death in 474 (24%) patients, and nonfatal myocardial infarction in 127 (7%) patients. Kaplan Meier curves demonstrate that higher decreases in baseline eGFR were associated with higher rates in all-cause mortality (P < 0.001) and cardiac events (P < 0.001) during follow-up (Figure 1). 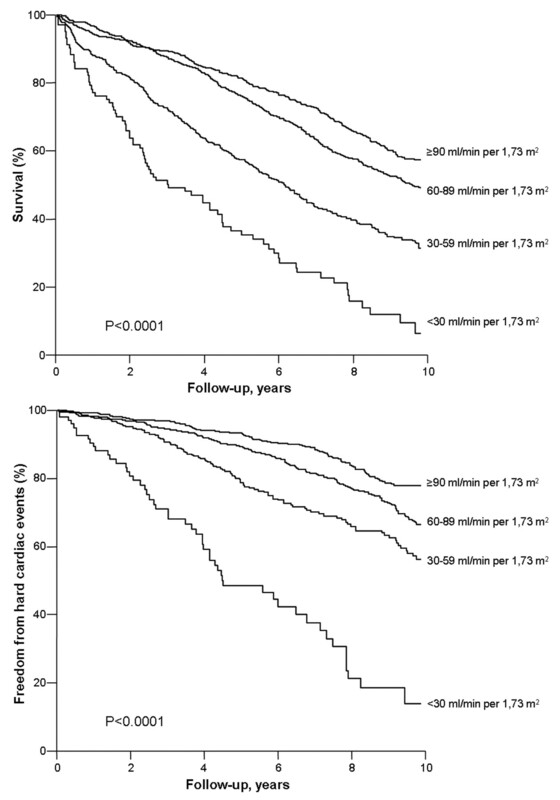 Kaplan-Meier curves for survival and freedom from hard cardiac events in patients with peripheral arterial disease (PAD) stratified according to the level of renal function. Patients with lower baseline ABI values were more likely to present with a lower baseline eGFR, compared with patients with higher ABI values (P < 0.001; Figure 2). In multivariate analysis, lower ABI values were significantly associated with a higher progression rate of ESRD (Table 2). Multivariate analysis also demonstrated that lower ABI values significantly correlated with higher all-cause mortality and cardiac event rate (Table 2). 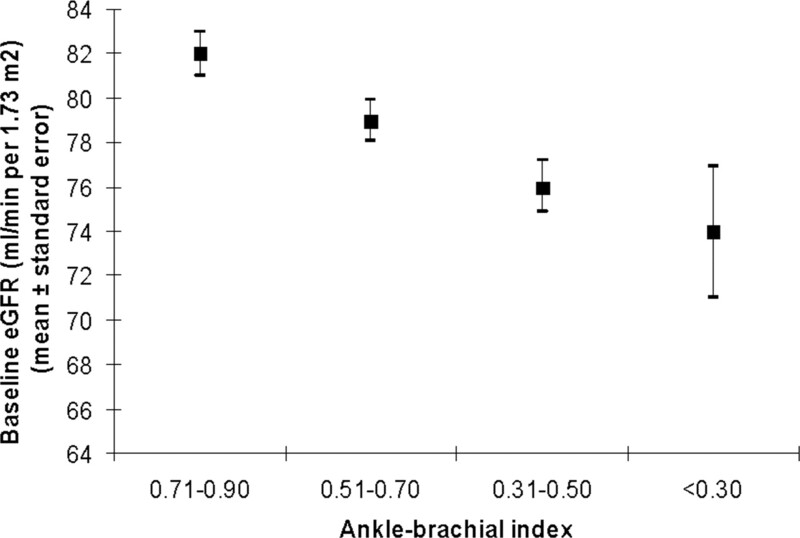 Baseline ankle-brachial index values in relation to baseline estimated GFR (eGFR; P < 0.001). Significant predictors for adverse long-term outcome were determined by stepwise multivariate analysis and are presented in Figure 3. Lower baseline eGFR (per 10 ml/min per 1.73 m2) and reduction in eGFR (per 25%) during the first year of follow-up both were significantly associated with higher all-cause mortality rate (hazard ratio [HR] 1.09 [95% confidence interval (CI) 1.06 to 1.12] and HR 1.05 [95% CI 1.01 to 1.09], respectively) and cardiac event rate (HR 1.07 [95% CI 1.02 to 1.11] and HR 1.04 [95% CI 1.00 to 1.08], respectively). Lower ABI (per 0.10 decrease) was also an independent predictor of mortality (HR 1.08; 95% CI 1.03 to 1.12) and cardiac events (HR 1.08; 95% CI 1.02 to 1.14). Importantly, chronic statin and ACEI use was associated with a lower all-cause mortality rate (HR 0.66 [95% CI 0.55 to 0.80] and HR 0.85 [95% CI 0.77 to 0.96], respectively) and lower cardiac event rate (HR 0.70 [95% CI 0.56 to 0.90] and HR 0.82 [95% CI 0.69 to 0.97], respectively). Although in multivariate analysis the combined treatment of statins and ACEI was associated with a decreased risk for all-cause mortality (HR 0.79; 95% CI 0.65 to 0.97) and cardiac events (HR 0.74; 95% CI 0.57 to 0.98), it was not independently associated with improved outcome in a multivariate model that included the single treatment of statin and ACEI therapy. Multivariate model demonstrating significant predictors of all-cause mortality and cardiac events in patients with PAD. Multivariate analysis demonstrated that long-term statin therapy was associated with a significantly lower risk for ESRD, mortality, and cardiac events during follow-up across all categories of renal function (Table 3). Tests for heterogeneity revealed nonsignificant P values for interaction (Table 3). ACEI were significantly associated with lower progression rate of ESRD, all-cause mortality, and cardiac events in patients with moderately reduced renal function, severely reduced renal function, and kidney failure but not in patients with preserved or mildly reduced renal function (Table 3). Tests for heterogeneity further revealed that statins and ACEI were associated with improved outcome among both patients with and without diabetes (NS P values for interaction). This study shows that renal dysfunction is highly prevalent among patients who present with PAD. Mildly reduced, moderately reduced, and severely reduced renal function and kidney failure were assessed in 42, 22, 3, and 2% of patients, respectively, perhaps reflecting the significance of generalized atherosclerosis as potential cause of renal dysfunction in patients with PAD. The mean baseline eGFR in this Dutch population of patients with PAD was 78 ml/min per 1.73 m2, which was almost similar to the results of the National Health and Nutrition Examination Survey, which found a mean eGFR of 77 ml/min per 1.73 m2 in a US population of patients who had PAD and were ≥40 yr of age. Many patients with PAD may present with undiagnosed renal dysfunction, which may eventually progress to chronic kidney disease or ESRD. In our population, 4% had progressed to ESRD at 1 yr of follow-up, and 10% had progressed to ESRD as assessed during the last follow-up visit. Baseline characteristics demonstrated that a lower ABI value, a measure of atherosclerotic disease severity, was associated with more severe baseline renal dysfunction. The Atherosclerosis Risk in Communities Study (ARIC) showed that patients with an ABI of 0.90 to 0.99 and <0.90 were at increased risk for serum creatinine increases over a 3-yr time period, compared with patients with ABI values >1.00 (19). This study showed that even in patients with ABI levels ≤0.90, lower ABI values can independently predict reductions in eGFR during follow-up and can identify patients who are at greatest risk for renal deterioration. Another strength is the use of ESRD as clinically significant end point in addition to declines in eGFR. This finding supports the notion that atherosclerosis has indirect effects on the kidney because of atherosclerotic lesions in the renal artery and that atherosclerosis or atherogenic factors induce directly intrarenal microvascular disease and renal injury (20). Low ABI value should therefore be regarded as a risk factor for development of ESRD. These high-risk patients may benefit from close renal monitoring and appropriate treatment strategies. A major finding in our study was that long-term use of statins was significantly associated with a lower rate of ESRD progression across all patients with different levels of baseline renal function. The beneficial properties of statins beyond the lipid-lowering effect include atherosclerotic plaque stabilization, oxidative stress reduction, and decrease in vascular inflammation (21,22). Intensive statin therapy may even result in significant regression of atherosclerosis, as demonstrated in a recent study (14). Given that atherosclerosis is now becoming a recognized cause of renal deterioration, it seems plausible that statins can prevent renal deterioration in patients with PAD, as a result of its pleiotropic effects. Experimental studies have suggested a preventive effect of statins on nephropathy (23,24). A meta-analysis showed that statins can reduce proteinuria or albuminuria, especially in patients with cardiovascular disease (25). Finally, a recent study demonstrated in 103 consecutive patients with hyperlipidemia and PAD that creatinine levels decreased after 3 to 4 mo of treatment with simvastatin, independent of the degree of LDL cholesterol reduction (26). This study also showed that long-term ACEI therapy was associated with a lower rate of renal deterioration, especially in patients with decreased baseline renal function. ACEI have been shown to inhibit the atherosclerotic process and improve vascular endothelial function, peripheral BP, and blood flow (16,27,28). Many studies have suggested that ACEI slow or halt the progression of chronic nephropathies (29). Patients with PAD may have a high rate of renal artery stenosis; in these patients, activation of the renin-angiotensin-aldosterone system serves to preserve renal blood flow and filtration rate. It should be noted that in our study population, ACEI were not prescribed to patients with bilateral renal artery stenosis or stenosis to a solitary kidney or to patients with decompensated congestive heart failure in a sodium-depleted state, to minimize the risk for acute renal failure. Our study failed to demonstrate an independent effect of the combined treatment of statins and ACEI. However, animal studies have demonstrated that combining statins and ACEI resulted in improved renal function; remarkable antiproteinuric effect; and less glomerulosclerosis, tubular damage, interstitial inflammation, and podocyte damage (30,31). These results are also supported by a previous clinical study that suggested that atorvastatin in addition to ACEI or angiotensin AT1 receptor antagonists reduce proteinuria and the rate of progression of kidney disease in patients with chronic kidney disease, proteinuria, and hypercholesterolemia (32). The prognosis of patients with PAD is characterized by a high cardiovascular event rate, as a result of the high prevalence of concomitant coronary artery disease. On the basis of previous reports in literature, patients with PAD are at two to four times increased risk for cardiovascular events, compared with patients with no PAD (33–37). Our study showed that across the whole range of renal function, statins were associated with a lower risk for mortality and cardiac events. The beneficial effect of ACEI was noted especially in patients with decreased renal function. The Heart Protection Study provided convincing evidence that 40 mg/d simvastatin significantly lowered the risk for vascular events in 6748 patients with PAD, when compared with placebo (11). The Heart Outcomes Prevention Evaluation (HOPE) study investigators showed in a subgroup of 4051 patients with PAD that ramipril significantly reduced the rate of major cardiovascular events (13). In our study, baseline eGFR and reduction in eGFR during the first year both were independent predictors of late mortality and cardiac events. In addition to ABI values, these variables may be useful to identify patients who are at increased risk and may benefit from statin and ACEI therapy. The main limitation of this study is that the findings must be interpreted in the context of the study design. For minimization of selection bias, propensity scores were added to multivariate analysis. The causal relationship between statins and ACEI and improved renal outcome could not be established in this observational cohort study. Randomized, controlled trials would be required to establish this. Second, the results apply to patients who are referred to a university hospital that acts as a tertiary referral center for 30 affiliated hospitals. Patients who are admitted to our hospital may have a higher risk profile compared with patients with suspected or known PAD in the general population. Extrapolation of our results to patients with PAD in the general population should therefore be done with caution. Furthermore, we used the Modification of Diet in Renal Disease (MDRD) equation to estimate renal function, and our study may be limited by the absence of data on albuminuria and proteinuria, which is recommended for the detection of early kidney disease. However, this equation is now widely used in clinical practice and has been recommended by the National Kidney Foundation practice guidelines as a useful estimation of renal function (16,17). Another limitation that should be mentioned is that it was not known whether patients with low ABI values may have been exposed to more intravenous contrast material during follow-up, leading to temporary or permanent renal dysfunction. However, imaging was performed with low-dosage contrast material, and the hospital protocol required cautious use of intravenous contrast material in patients with severe ABI. Finally, before implementation of routine use of ACEI in clinical practice in patients who have PAD with or without renal dysfunction, future studies should confirm its safety. This long-term prospective cohort study showed that renal dysfunction is highly prevalent among patients with PAD. Lower ABI values proved to be correlated with renal deterioration and may be used to identify patients who are at increased risk for ESRD. Baseline eGFR and reductions in 1-yr eGFR could also identify patients who are at increased risk for mortality and cardiac events, in addition to ABI values. These patients may benefit from long-term statins and ACEI therapy, which was demonstrated to be associated with a lower progression rate of ESRD. In patients with PAD, statins and ACEI were significantly associated with improved survival and freedom from cardiac events. Tests for heterogeneity revealed that the beneficial effect of statins existed across the whole range of renal function and among both patients with and without diabetes. ACEI were associated with improved renal and cardiovascular outcome, especially in patients with reduced baseline renal function.